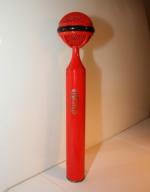 The Pearl Vocal uses true electrostatic single diaphragm cardioid capsule, providing full audio spectrum. Capsule is internally shock-mounted. Dual mesh head plus internal cone-shape pop filter effectively protects diaphragm from plosive sounds of vocals and speech. Effectively protects diaphragm from plosive sounds. 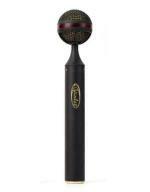 The microphone is designed for handheld or stage stand use on supplied holder. It can be mounted on optional external studio shock mounts for additional protection from external subsonic interference. 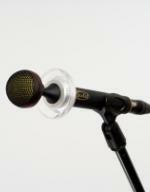 Optional Reflection Ring adds warmth, reduces feedback and protects against wrong handheld use of microphone. 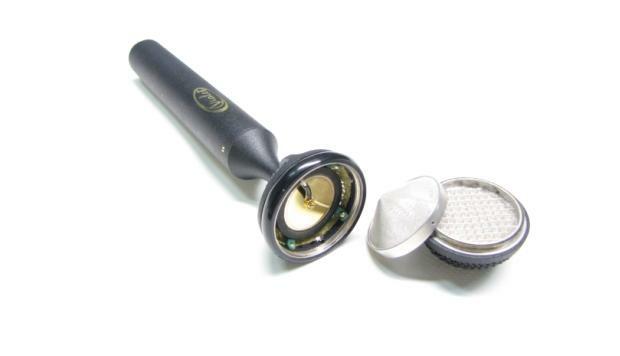 The Pearl Vocal is designed for use in today`s modern improved quality P.A. systems as high-end vocal stage microphone. 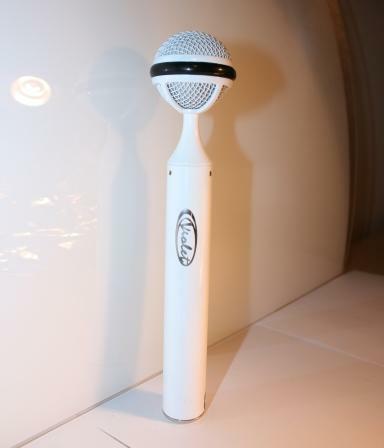 The Pearl Vocal is specifically designed to be the ultimate condenser hand-held stage microphone. The newly developed medium-sized single diaphragm capsule provides high acoustic transparency and can handle sound pressure levels up to 144db without overload. FRR is an optional unique reflection ring accessory which is used as a tool to slightly alter directional characteristics and frequency response by positioning at different points along the microphone body. FRR Reflection Ring is a reflector disc which can be positioned at the head or anywhere along the body of the microphone to alter the polar pattern, frequency response and sensitivity. Positioning the FRR on the top produces a polar pattern closer to a half-sphere pattern with less coloration at different angles, less proximity effect and adds sensitivity to all except high frequencies. Positioning the FRR lower of "The Pearl Vocal" reflector alters low-frequency response and adds proximity effect. The FRR can also be used to separate the front and rear sides of the capsule and to reduce reflections and reverberation from reaching the capsule. 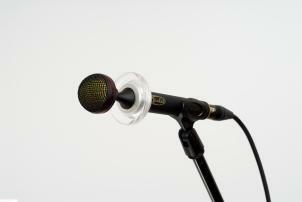 FRR adds warmth, reduces acoustic feedback and protects against wrong handling of microphone. You can manipulate with sound using FRR. The Pearl Vocal introduce a new physical design with a rear-ported spherical head and a special narrow tapered form reflector to reduce internal resonances and reflections and optimize the unidirectional cardiod polar pattern. A soft center band around the circumference of the head minimizes shock and handling noise. Rugged microphone construction and internal shockmounts effectively reduce stand rumble, outside infrasonic interference and mechanical shocks. The internal phantom powered preamplifier's Class 'A' fully discrete transformerless circuit provides high output, flat audio response and ultra low distortion and noise. The output connectors are gold plated for best possible signal transfer. "The Pearl" is ready for noise-free handheld or stand use. A flexible stand holder is supplied with microphone. FRR is an optional unique reflection ring accessory which is used as a tool to slightly alter directional characteristics and frequency response by positioning at different points along the microphone body. The Pearl Standard and The Grand Pearl microphones are designed primarily for vocalists, but are also capable of capturing piano, guitars, drums, percussion, strings, wind and many other instruments. The larger diaphragm of The Grand Pearl is specially tuned to provide a deep warm vocal tone ideal for jazz or pop music. These are unidirectional cardioid microphones and should be mounted so that the rear openings behind the capsule are not obstructed. In vocal applications, best results are obtained when the microphone is 1" to 6" away. Microphone overload is not a problem, however, we recommend the use an optional pop filter in the studio for further protection from plosive sounds and breath, pop or wind noise. The Pearl Vocal has been tuned specifically for a modern, detailed vocal sound with extended vocal presence and optimized low-end response. The newly developed advanced suspension system effectively reduces handling noise to an absolute minimum and the unidirectional cardioid polar pattern has been optimized for maximum side and rear rejection while providing maximum gain before feedback. This is the ideal microphone for live jazz, pop and rock vocalists but also will provide superior sound for brass, woodwinds, percussionists, drummers and in capturing guitar amplifiers.